Clean & Dry Fast:2018 New Version,Just a few seconds,it can clean all the caked in residue for easier application.Quick easy steps will change your life forever. Cleaning Brushes Effectively: The brush cleaner can strip away,powder, dirt, oil.It extends the life of your makeup brushes by keeping them clean, soft, nice and long-lasting. Brush cleaning in a simple and effective way,no more waiting 24+ hours for brushes to dry.Slip a brush into the collar and you're ready to go. 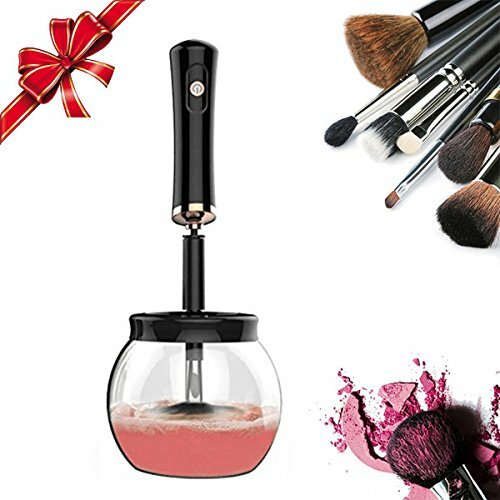 Durable:The makeup brush cleaner is made from top quality material to ensure long-lasting use,it is nontoxic, environmental friendly.A classy box with everything packed tightly inside will be delivered to you.Especially for makeup fans!Save time to do more interesting things! Easy to operate:a.fasten the brush to the attachments.b.Pour appropriate water and soap into the bowl. c.soak brush into water for a while then press button to wash and dry. Good service: Qirageins offers a 30-day warranty and one-year after-sales service. Don't hesitate to contact us if you have any questions.